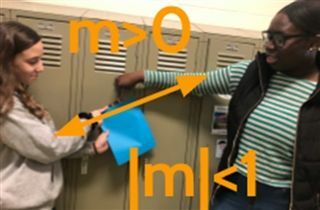 Sarah Shartzer’s eighth grade Algebra 1 students recently learned about slopes by completing a scavenger hunt around campus. The scavenger hunt required students to solve problems, then go out to find visual representations of their lines. They worked in teams of three or four to search for slope throughout the building. This fun activity was a great way to reinforce what the students are studying in the classroom. Students are graphing lines and writing linear equations, and learning about the characteristics of slope—whether it’s steep or shallow and positive or negative. The students had a great time completing the scavenger hunt!